Little Daisy Dee is indisputably the sweetest blossom in her parents’ California, KY home, but there are also some mighty sweet things coming out of her mother’s private commercial baking kitchen. “My grandma’s house was my incubator,” says Andrea Dee, about the earliest days of her cake business. She’s come a long way since baking cakes in her grandma’s basement. Her homegrown confections have caught the eye — and taste — of brides who want a decidedly local and natural touch to their weddings. “Right now we’re doing a lot of textured cakes that look like your Nana made it,” says Dee. While highly decorated cakes are fun, and she certainly can create them, Dee says, to her, they’re not as delicious. Her “fluffy, buttery” cakes are right at home with the increasingly popular rustic weddings, and hummingbird cakes, she says, top the list of favorites. Using all natural, gourmet, farm-fresh and homegrown ingredients, Dee crafts artisan wedding cakes for up to 30 local weddings a year. Her 2016 calendar is already fully booked. Her homegrown batters are blended with Kentucky-grown unbleached flour from Weisenberger Mill in Midway; local farm-fresh fruits, like berries from Bright Star Acres in Piner; honey from Poverty Hollow Farm in Morning View and Beezy Bees in California; maple syrups from Red Sunflower Farm in Independence; spices from Colonel De Spice Shop; and jams from Boyd’s Orchard in Versailles. She’ll cross the Ohio River for eggs from Holistic Acres in Ashland, OH; milk from Snowville Creamery in Pomeroy; and grass grazed dairy butter from Hartzler Family Dairy in Wooster. “I’ve done a lot of cakes at this point, and decorating is fun, but I love meeting with the farmers,” says Dee. 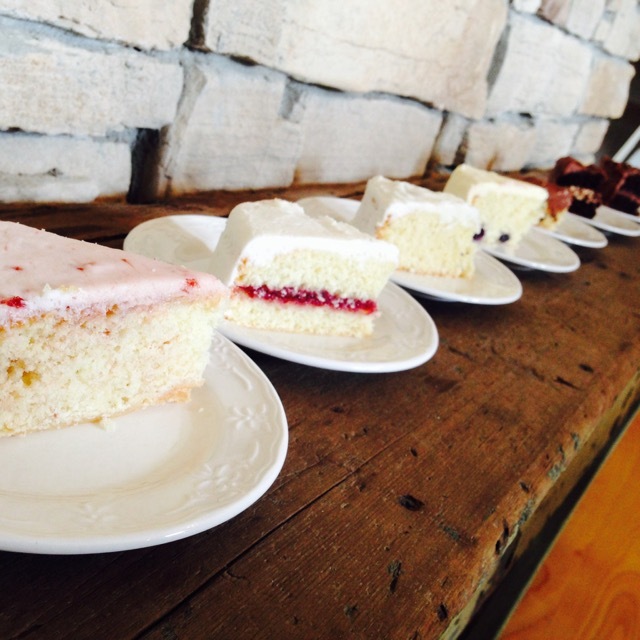 Home Grown Cakes is the culmination of a love for gardening, baking, and serving a product that is true to the culinary standards that Dee sets for herself and her family. She caught the baking bug early, baking her first blue-ribbon cake 18 years ago for the Campbell County Fair. She says she was blessed with teachers at Campbell County High School who listened when she said she wanted to learn how to bake cakes. Her school guidance counselor set her up with a co-op at Newport’s Fantasy and Frosting so she could leave school half of the day and work at the cake shop. “They taught me how to decorate,” she says. When she graduated from high school there were no nearby opportunities for a culinary education. She couldn’t afford to go away to school, so she enrolled at NKU, lived at home and baked cakes our of her parents’ house to help pay for college. “I knew I needed to get a college degree, but what I really wanted to do was sell at the farmer’s market, which is what my mother grew up doing,” says Dee. She scoured area schools, wondering where to turn to learn about plants. She decided a horticulture degree was the academic route to her goal and enrolled in the University of Cincinnati’s horticulture program. After graduation she took a job as an assistant with the Kenton County Cooperative Extension Office, which is through the University of Kentucky, and soon became an extension agent. The job was a busy one, with frequent weekend and evening hours, but she enjoyed the work. She assisted rural farmers as well as community and urban gardeners. “You learn so much beyond your degree — in produce, local foods and the whole system,” says Dee. Married to her high school sweetheart Troy, Dee was working full time and baking cakes in the kitchen that they built in her grandma’s basement. She worked as an extension agent for almost nine years, then gave birth to her daughter Daisy. She was ready to find a farm of her own. “We wanted to save money for a farm so we looked for two years and cakes really helped supplement,” she says. They found the house in California on a flat acre where she could plant a garden and build a commercial kitchen of her own. 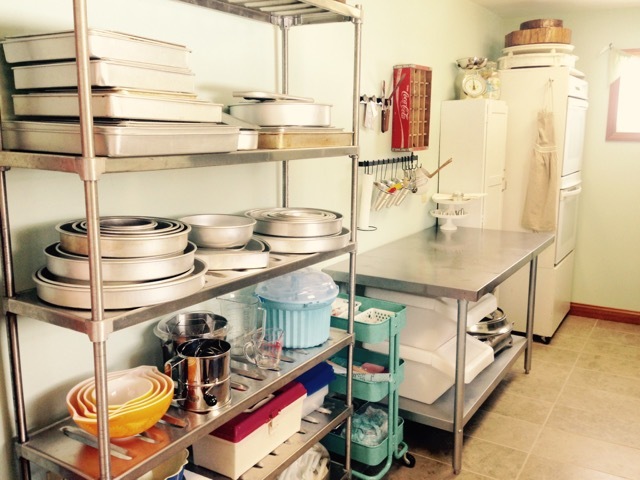 “I call it a food truck that just backed up to the house,” says Dee about the transformation of a narrow laundry room into her private certified commercial baking kitchen. Her small garden provides ample space to grow strawberries, blackberries and raspberries. She’s planted a few fruit trees and expects apples by next year. In the meantime, local farmers meet her needs. The decision to bake only with natural, local ingredients spurred from the same standards she sets for herself, Troy and Daisy. “We eat all local, so when we do a food product I didn’t see how I could buy conventional eggs and sugars that I didn’t eat myself, or milk that wasn’t free range, or grass fed dairy products, and sell it at larger quantities than I was eating myself,” she says. Plus, she says, it matters to her to support the local economy. “The further along I got in my own choices, I thought ‘I have to do it this way,’” says Dee. Because of the nature of her product, Dee bakes for a lot of farm weddings, and the farthest she travels for a wedding is generally an hour away. “I go to The Josephina a lot which is in Dry Ridge and is a converted barn,” says Dee. Neltner’s Farm in Camp Springs is another popular venue for her, as is The Inn at Oneonta in Melbourne. “Oneonta is where I got married, and it’s gorgeous,” says Dee. Most of her clients, she says, are from Cincinnati. 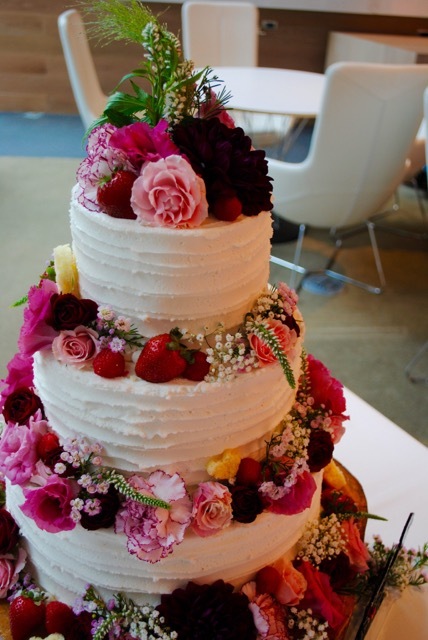 Brides will make a one-time visit to her home in California where they sit at her table and chat about their ideas for a wedding cake, and sometimes wedding flowers too. In the summer Dee teams up with her mother to design fresh, whimsical wedding floral arrangements. Homegrown – sharing what one produces – is a bit of a tradition for Dee and the women in her family. Her grandmother – her incubator – sold her own produce at Lunken Farmer’s Market in Cincinnati when she and Dee’s grandfather were raising their four children. “Now she’s my biggest fan,” says Dee.